It is a lovely cool summer morning and I am finally feeling better, yay! Thank you so much to everyone for your get well wishes and also to everyone who has entered my giveaway. If you haven't entered yet, it is open until August 10 so there is plenty of time. 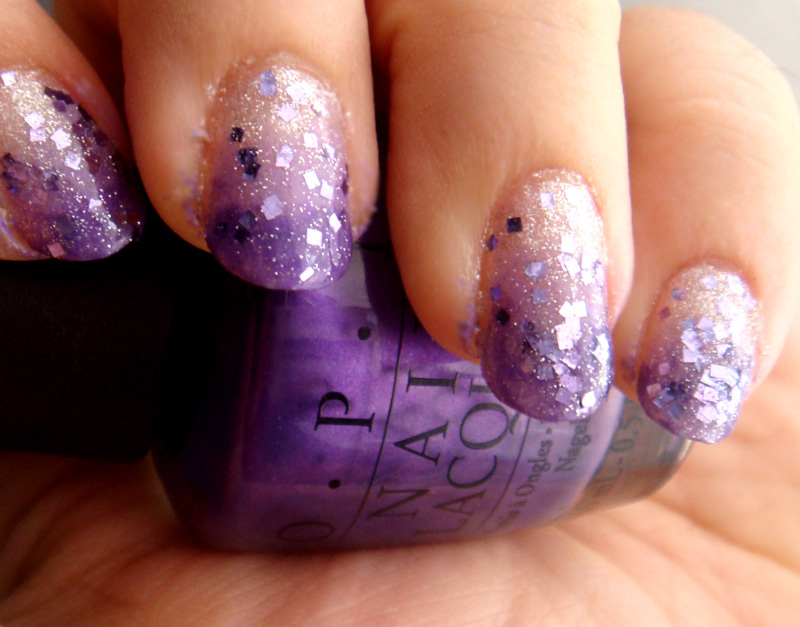 Today I want to share a purple gradation nail tutorial that I did a few weeks ago. I did it using Zoya Snowsicle as my base. I really like this colour because even though it's sheer it is very sparkly and pretty. In the photo I am wearing two coats without top coat. Pretty nice, isn't it? Here is what you are going to need for this tutorial. Base coat and top coat, a fairly light colour as your gradation base (I used Zoya Snowsicle), and two purple colours, one lighter and one darker (I used OPI's Do You Lilac It and Purple With A Purpose), a purple glitter (I used BarryM's Lavender Hexograms) and a piece of a make up sponge. After applying base coat and two layers of the gradation base colour, it is time to use the sponge. Drop a bit of the ligther colour on a piece of paper and then dab the sponge in it. Gently press the sponge on the top 2/3 parts of your nail until it is covered with the colour. Then take the darker colour, do the same and this time cover the top 1/3 of your nail. To add extra sparkle apply a layer of the glitter polish. I had a lot of fun doing this and it was actually my first time trying the sponging effect. I have seen quite a few tutorials both online and on magazines and I have to admit it was easier than I thought. Very pretty! I'll have to give this a try sometime. Fantastic tutorial! !I've been wanting to try a graduation mani for ages but I'm chicken cause I know I'll make a huge mess haha. Snowsicle is so pretty, looks great as a base for french manis etc. I absolutely love the end result! I love this, especially with the glitter layer on top! I am glad you liked the tutorial.